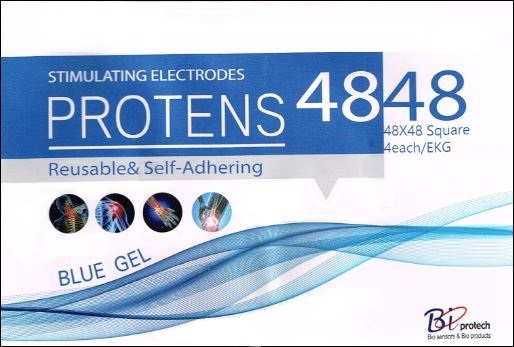 The PROTENS Blue Gel Neurostimulation Electrodes are specifically designed for patients with sensitive skin, providing light, mild adhesion, without compromising conductivity throughout the area of the pad, resulting in effective electro-therapeutic stimulation when and where you need it most. Patented skin-friendly blue hydrogel offers a more mild adhesion compared to many other electrodes on the market, but structurally sound enough to allow most patients multiple uses per pack. 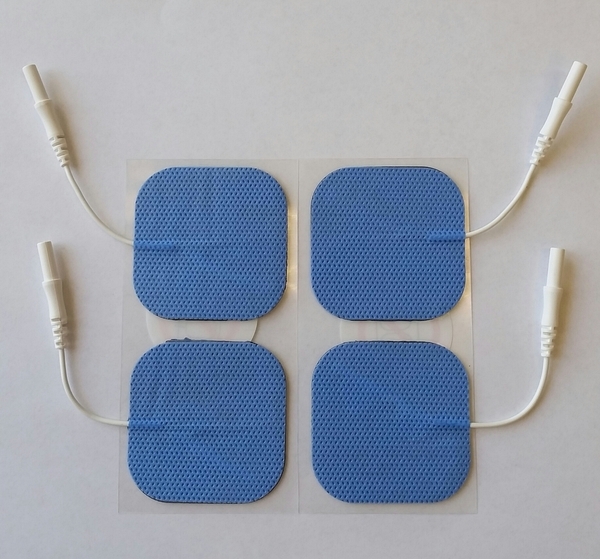 Additionally, whereas many conventional electrode pads may include latex and/or a specific acid as partial ingredients in the adhesive gel, which are the two known factors that may ever cause an allergic reaction and skin irritation for users with sensitive skin, the PROTENS electrodes instead go through a different, and expensive, production process to manufacture and cure the gel, without the use of any latex or acid. Available for sale in packs of 4 individual pads, per pack. Case Quantity = 500 packs per case. Features industry-standard, 2mm diameter, female pin-style connector for easy compatibility with most lead wires, and, therefore, most portable and clinical electrotherapy devices. 2" x 2" square (48 x 48mm) is most common and versatile size and shape, for comfortable application on most areas of the body. Blue color, cloth-based backing of the pads also helps maintain structural integrity, but allows flexibility to contour to the skin. Can be used for such electrotherapy modalities as TENS, EMS/NMES, Interferential (IFC), Russian Stim, and Microcurrent. Wash & trim hair at the treatment site. Never shave. Make sure your electrotherapy unit is first turned off. Connect electrodes to the unit via lead wires while they are still on the clear plastic liner. Apply the electrodes to clean, unbroken skin as prescribed. After treatment, carefully peel the pads from the skin and replace them back on the plastic liner as indicated. Do not use the pigtail lead wire connector to pull the electrodes off as this will damage the electrodes. Store the electrodes sealed in the zip-lock poly bag packaging when not in use. Store in a cool, dark place such as the refrigerator. If electrodes begin to appear dry and lose their adhesive quality, rehydrate with a few drops of water or Conductive Spray, rubbed evenly across the gel surface, to prolong the life of the pads and get a few more uses before discarding them. NOTE: Although the electrodes are indeed hypo-allergenic, there is no guarantee that they will NEVER cause some degree of skin irritation for any, and every, patient. Purchase, and use, at your own risk. The hypoallergenic electrodes work marvelously. I could barely stand to use the TENS with the others after I started itching ferociously after an hours use and had to use anti-itch creams and gel. NOW SWEET RELIEF! Yes I am happy with these electrodes because they are the only ones that do not cause my skin to brake out into a rash. The blue ones work best for me. I will be ordering more soon. The blue tens pads are great. With standard pads my whole back and neck would be a solid rash, even if I did not have a pad in that spot. With these pads I have almost no marks anywhere on my back and if I need to I can put the pads back in the same place the next day. As always they lose some of the stickiness after the first use. But the recommendations are to put a few drops of water on the pad and that generally works. I would say they stick as well as the non hypoallergenic. I have not tried the gel as a supplement to stickiness, just water. I have used two sets of 4 in rotation for about 4 weeks on a 24/7 basis. Occasionally I have one sticking to my shirt but it is usually when I am sleeping and wiggling in bed. If you get any rash from regular pads I highly recommend these hypoallergenic pads. I have had trouble with electrodes breaking me out.The Blue Cloth Electrodes are good on my skin. They don't break me out at all but they sure can't be used much. After about 3 times putting them they lose the stickiness. I use the gel on them that I have use on other pads at it takes ALL the stickiness off of them. I have to wear the Tens most every day because of surgery and need a pad that is hypo allergenic. These meet that great but they are going to be expensive since they just don't last all that long. so rating them is kind of hard. Would give 5 star for not breaking me out but probably a 2 because they just don't last long. So far I am very pleased with them. However, when removing one of them the lead came completely out of the electrode. So that is why I ordered two sets the second time.